Department of Metabolic Diseases, Medical College, Jagiellonian University, 15 Kopernika Street, 31-501 Krakow, Poland, e-mail: mmalecki@cm-uj.krakow.pl. Probably the most urgent problem in the field of diabetology, and one of the most important in XXI. century medicine, is an epidemic of type 2 diabetes mellitus. It is estimated that the number of people with diabetes worldwide exceeds 200 million [1, 2]. Most of them are patients with type 2 diabetes. In the societies of the industrialized world the prevalence of this disease has reached a few percent of the entire population and is still growing [1, 2]. For many decades type 2 diabetes, formerly referred to as non-insulin-dependent, has been regarded a less dangerous type of disease by both the patients and their doctors. Just recall, "latent diabetes", "biochemical diabetes", "diabetes of old age". Wrong!!! The scientists, physicians, patients, politicians and entire societies must now realize that type 2 diabetes is a leading cause of premature death, mainly due to cardiovascular causes, and of occurrence of complications that can lead to blindness, amputations, and renal insufficiency. The life expectancy of millions of patients is shortened due to the diagnosis of type 2 diabetes . The disease imposes huge human and economic costs on patients, their families, local communities, health care systems, and societies . Type 2 diabetes is characterized by two major defects: impaired insulin secretion and a decrease in its peripheral action . Both of them have roots in the interaction of genetic and environmental factors. Moreover, there is growing evidence that genetic background also influences the complications of type 2 diabetes mellitus [6-8]. A long time before molecular biology bloomed as it does today, scientists were able to provide evidence that genetic factors influenced susceptibility to type 2 diabetes mellitus. The disease clustered in families, the concordance rate in monozygotic twins was higher than in dizygotic ones, and in addition there were populations, for example Pima Indians, with such a high prevalence of type 2 diabetes mellitus that could only be explained by genetic predisposition [5, 9, 10]. In the last decade substantial progress has been made in the genetic methods enabling the identification of the actual sequence differences responsible for the occurrence of the disease. So far, mutations in about ten genes have been linked to the development of monogenic, for example autosomal dominant (MODY - maturity onset diabetes of the young) or maternally inherited, forms of type 2 diabetes mellitus [11-13]. All of these forms are relatively rare and were found to be responsible for a few percent of all type 2 diabetes cases. Monogenic diabetes is usually characterized by high phenotypic penetrance and severe impairment in insulin secretion [11, 13]. Less effective were efforts aiming to identify genes responsible for the more common, polygenic form of the disease. This diabetes usually develops in the middle and later years of life and occurs with both: impaired insulin secretion and insulin resistance. The clinical picture is created by the interaction of the environment and genetic factors, such as frequent polymorphisms of many genes, not just one. Those polymorphisms may be localized in the coding or regulatory parts of the genes and are present, although with different frequencies, in diabetes patients as well as in healthy populations . Sequence differences in two genes have been associated so far with the complex form of type 2 diabetes: calpain 10 and PPARγ [15, 16]. Polymorphisms in those genes mainly affect sensitivity to insulin in humans [17, 18]. In addition, some evidence exists that genes, such as adiponectin , sulfonylurea receptor 1 (SUR1) , HFE hemochromatosis gene , and insulin  may also influence susceptibility to this disease acting through different mechanisms. Efforts are being made to verify the hypothesis that frequent polymorphisms in the MODY genes may contribute to the development of the more common forms of late onset type 2 diabetes [23-26]. Not only diabetes, both type 1 and type 2, but also their complications seem to be influenced by genetic factors. The strongest evidence from epidemiological observations and family studies for the role of molecular background has been found for diabetic nephropathy. The majority of data come from studies performed in type 1 [27, 28], but some studies were carried out in type 2 diabetes [7, 29, 30]. Unlike for nephropathy the epidemiological studies do not provide strong support for the role of genes in diabetic retinopathy , however some clinical observations and genetic analyses in type 2 diabetes mellitus [30, 32] suggest that genetic influences are also present in this microvascular complication. In addition to the microvasculature, it is important to define the role of genes in the occurrence of macrovascular complications, mainly coronary artery disease, in patients with diabetes. 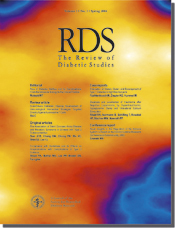 In this context one should emphasize that the UKPDS study showed significant ethnic differences in the incidence of cardiovascular diseases in type 2 diabetes patients, that were very likely the result of the heterogeneity of their genetic background . Hundreds of loci have been studied so far in order to explain genetic susceptibility to diabetic complications. However, associations described for specific polymorphisms in different studies seem to be rather weak and inconsistent. The major reason is probably the complex etiology of all diabetic complications that are the result of interaction between plural genetic and clinical factors. Nevertheless, it should be pointed out that some studies produced promising results and have been replicated in other populations. One should mention the aldose reductase, a gene from the polyol pathway, associated with diabetic nephropathy and retinopathy in type 1 and type 2 diabetes in several studies [33-36]. Another good example is haptoglobin, a candidate gene from the group of antioxidant proteins, that was linked to cardiovascular complications in different populations [37-39]. There is little doubt that the coming years will bring new fascinating discoveries in the field of genetic susceptibility to type 2 diabetes mellitus and its complications. The important question is how to use this knowledge of molecular background in clinical practice for the benefit of individual patients as well as entire societies. We should notice, however, that genetic research in type 2 diabetes already has not only scientific, but also prognostic and prophylactic significance, moreover it sometimes determines therapeutic decisions. For example, the molecular diagnosis of MODY that in some countries has become clinical reality is not just the domain of the scientific research . It influences the mode of treatment of diabetes patients in the family, since it is generally accepted that the sulfonylurea are the agents of choice in this form of diabetes . This diagnosis also defines the risk of diabetes, since on average 50% of individuals in each generation develop the disease . Molecular genetic testing can specifically indicate the carriers of the mutations, i.e. who are very likely to develop diabetes, but it can also provide relief for those who did not inherit the disease variant. While the prophylaxis of diabetes does not work in MODY and the penetrance rate is very high, it should be very effective for diabetes complications, since frequent glucose level examination of susceptible individuals can lead to early diagnosis and introduction to treatment. This is particularly important for the women from MODY families planning pregnancy. The results of genetic studies of the complex form of type 2 diabetes mellitus and its complications had much less influence on clinical practice than in the case of monogenic disease. However, one may imagine that in future the identification of the carriers of certain sequence differences predisposing to type 2 diabetes mellitus will allow the introduction of specifically intensive behavioral and pharmacological intervention in this group. Moreover, the type of specific pharmacological intervention may depend on the genetic background of the individual. Similarly, the identification of the carriers of susceptibility alleles for chronic diabetic complications may lead to the introduction of clinical measures in this group that aim to maintain the diabetic compensation as well as possible. A further option would be the consideration of early use of medications that can protect the patient from the development of vascular complications, such as ACE inhibitors or antioxidants. Their nature may also depend on the genetic factors inherited by the patient. Finally, gene therapy completes the scenario for future approaches to type 2 diabetes mellitus and chronic complications of the disease .